The following is the official legal opinion (fatwa) from his eminence, Sayyid al-Sistani, in response to questions on the spending and handling of khums dues as well as the necessity of an official religious receipt. May the Peace, Mercy and Blessings of God be upon you. A. Is it permissible to spend it on any needy person whom the person wants to help? Answer: In His Name, the Most High. The person cannot spend it on anything but securing the basic and necessary needs of religiously practicing believers, including food, medical treatment, and the like. B. Is it permissible to delegate another person in spending it, by giving the Islamic dues to another person and authorizing that person to identify those in need as well as the amount to give them? Answer: The person is not allowed to do this. C. Is it permissible to transfer it to another country? Answer: The person is not allowed to do this unless the person has eligible relatives in that country. 2) Is a religiously responsible person (one who is Mukallaf) relieved of the religious responsibility if he/she paid his/her Islamic dues to a person whom he/she believed was eligible but then turned out not to be? Answer: The person is not relieved of the religious responsibility if he/she fell short in checking out the condition of the recipient. Rather, as a matter of obligatory precaution (ihtiyat luzumi), the person is not relieved of the religious responsibility even if he/she did not fall short in checking out the condition of the recipient. 3) There are some individuals who claim agency (wakalat) on behalf of his eminence, Sayyid Al-Sistani, or that they have an official recommendation and trustworthiness letter (e’temadiyya) from his office, or that they are connected to you in some other way. These individuals accept the Islamic dues from believers and, in return, they do not give them a receipt issued from his eminence’s office. Is one who has to pay his/her Islamic dues relieved of the religious responsibility by paying the dues to these individuals? Answer: The person is not relieved of the religious responsibility by doing so, and Allah is the Guide. The following is the official legal opinion (fatwa) from his eminence, Sayyid al-Sistani, in response to a question on how the jurists’ agents are verified to be authorized. To The Office of Grand Ayatullah Sayyid Ali al-Sistani (may Allah prolong his life), Holy city of Qum, Iran. Question 1: What conditions are placed on someone who identifies himself as a representative or authorized agent of a Jurist? Answer: He must hold a written (documented and signed) authorization letter from the Jurist. Question 2: What is the mechanism to verify the veracity (truthfulness) of a person who claims that he is an authorized agent of a Jurist? Answer: To ask that he show his written (documented and signed) authorization letter. The following is the official legal opinion (fatwa) from his eminence, Sayyid al-Sistani, in response to a question from his authorized agent (wakeel) Sayyid Murtadha Kashmiri when asked if the obligation of khums is completed by simply delivering dues to the authorized agent. To the Honorable Sayyid Murtadha al-Kashmiri May God continue his success. As-Salamu Alaykum wa Rahmatullah wa Barakatuh. We ask the highest and most powerful Almighty Allah to continue his support and success to you all. In reply to the believers’ inquiries, we emphasize once again for those who pay their religious dues that their fulfillment is not complete by just delivering their dues to an authorized agent/ Wakeel, rather they are obligated to ask him for a receipt which is issued by us (our offices). Otherwise, the payer’s obligation is not considered fulfilled without an official receipt even though the cause may be due to forgetfulness, inadvertent mistake, or otherwise. I ask almighty Allah to guide all and give them all goodness and success. Peace be up you all. 1) Does the reciept have to be signed by Ayatollah himself or is anyone else authorized to sign? A.yes, him or any of his Liaison officers. 2) Can the recpt be from London , Qom ,Syria or USA office besides iraq & WHO/Which office is authorised to issue & what does the signature look like. A.There are several offices please let us know the office you want to get involved with and we will let you know whether it is authorized or not. 3) Do we have to insist on original or a copy recd b y fax is ok to accept ? A.As long as the payer knows that the reciept was issued by him or any of his authorized offices then it shouldn't be a problem. 4) We cannot read arabic ijazas so can we give khums to person who is known to be representative in the city OR should we insist on seeing the copy of the ijaza .Very often we cannot get a copy to get it read by others . What is our responsibility in this case? A.Yes you have to see the IJAZA and if it was in Arabic or Persian, then a translation of the language of the community must be made available, so that the people can pracctice their finacial religious rights and responsibility towards paying their dues properly, and if the taker does not provide or refuses to do such then S. Sistani or one of his offices must be informed. 5)In case we hand over the amount , within how much time we are expected to recieve the reciept & what if this is not recd ?Is our responsibility complete? A.Your responsibility is incomplete as per clear Agha's words in the attachment, that the payer is not relieved from his responsibility until he gets the receipt. 6)Is an authorised representative of Ayatullah Sistani(h) permitted to allow differment of Khums payment ,even if the payer has the ability to pay ie for some reasons of better disbursement or convienience etc ? Also it takes some time to calculate the excat khums amt , but broad figs afre known on khums date . Can one take time of say 1 - 2 months to calculate khums & pay only thereafter ? 585. Question: What is the limit that you have allowed your agents and representatives (wukalã’) to utilize for their personal use from the religious dues that they collect [from the people]? Answer: In our ijãzas (authorizations for apportioning the religious dues), we have mentioned that the authorized person is allowed to utilize, for example, one-third or half of whatever he collects of religious dues for the purposes that have been defined by the shari‘a. This does not mean that the percentage mentioned [in the ijãza] is especially for the use of the authorized person himself, because it could happen at times that the use of that due would not apply to him at all — for example, if he is a sayyid while the religious dues that he has collected are from the charity of non-sayyid or other charities like it. 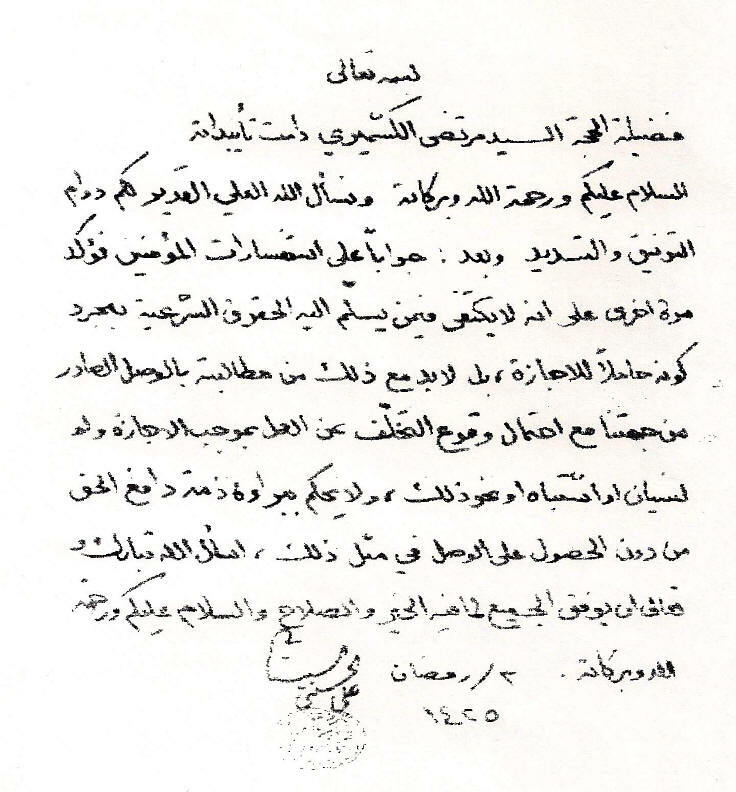 In the light of this, if the authorized person considers himself —in keeping with Allãh as the witness in this matter— eligible for the religious dues in accordance with the conditions mentioned in the Manual of Islamic Laws —for example, if he is needy in the religious definition and is among those who deserve the right of zakãt or sihm-e sãdãt or radd madhãlim etc— he is allowed to take from it according to his need and proportionate to his status and not more than that. Similarly, if he is providing general religious services and strives for upholding the word of Islam, he deserves the sihm-e Imãm (a.s.) according to the level of his work and the service that he does for Islam. But, if he is not spending the religious due that he has collected, he must utilize the percentage mentioned [in the ijãza] in its appropriate causes as defined by the shari‘a. (a) Is he allowed to talk about it to other people, even if he is not certain about the truth of the allegations levelled against the representative? What if he is certain about them? (b) Is he allowed to still pay his religious dues to that representative as long as he is uncertain about his not being trustworthy? (a) It is not permissible for him [to talk to the others about it] in both situations. In the second case [of certainty], he can inform the marja‘ directly in complete confidence about the real situation so that the marja‘ may take whatever action he deems appropriate. (b) He should rather pay his religious dues to a representative who is known for his integrity and honesty in acting according to his ijãza, i.e. in using some portion of what he has collected of it in their appropriate causes as mentioned earlier and sending the rest to the marja‘. 587. Question: Is it permissible to use the sihm-e Imãm (a.s.) without seeking the permission of the marja‘ if a person can ascertain the need of any kind for its use with which the Imam (a.s.) would be pleased? Answer: It is not permissible; and one cannot attain the approval of the Imam (a.s.) by using his portion of the khums without seeking the permission of the most learned marja‘ —in that it is possible that the marja‘’s permission is part of the approval of the Imam (a.s.). 588. Question: Is it permissible to use the sihm-e Imam (a.s.) in charitable projects while there are tens of thousands of believers who are in need of bread, cloths, etc.? Answer: In using the sihm-e Imam (a.s.), it is important to consider the principle of priorities. It is a matter of obligatory precaution, the determination of “most important vis-à-vis the more important” should be left to the discretion of the most learned jurist who is well informed about the general situation.